These sour gummy candies are shaped like hearts and come in 12 flavors: Meyer Lemon, Grapefruit, Pomegranate, Fuji Apple, Watermelon, Tangerine, Margarita, Blueberry, Mango, Strawberry Daiquiri, Mango, Bing cherry and Georgia Peach. 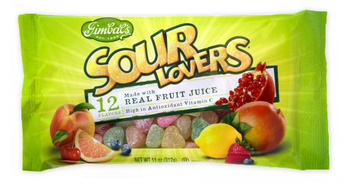 The best thing about these is not only the flavors (which are phenomenal), but the fact that they arenâ€™t just sour on the outside; they are also sour on the inside. I noticed this when I sucked off the outer sour coating and figured out that the gummy in my mouth was still sour. It was confirmed when I visited the Gimbalâ€™s website. They actually put the sour making ingredients into the gummy mixture and then coat the gummies in the sour mixture too. The gummy is that good, tooth-sticking kind of gummy that makes the flavors linger for so long. You get such a good long chew with these and in combination with the incredible flavors and the double sour whammy… these are a phenomenal candy that is not to be missed. 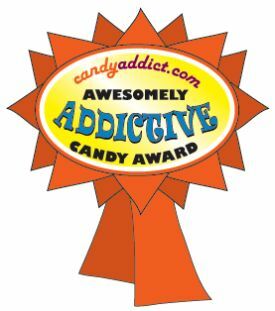 I hereby award them the coveted Candy Addict Awesomely Addictive Candy Award! Hi Jennifer, I really love the sour taste. I love all the incredible flavors. I totally agree! This are the real deal, and it’s the sour flavor INSIDE (not just outside) that makes them special. Love these! Tried these sour gems for the first time last month. Cant get enough of these! I got my sister & the nurses & doctors at the hospital hooked on these. The flavors are outstanding!